Well maybe next time they'll do some research first. Crap, are we eating this every day? Chinese tourism authorities are seeking investment to build a novel concept attraction - the world's first "women's town", where men get punished for disobedience, an official said on Thursday. The 2.3-square-kilometre Longshuihu village in the Shuangqiao district of Chongqing municipality, also known as "women's town", was based on the local traditional concept of "women rule and men obey", a tourism official told Reuters. The tourism bureau planned to invest between 200 million yuan ($31.2 million) and 300 million yuan in infrastructure, roads and buildings, Li said. Poor Italy! Whatever have they done to harm us!! 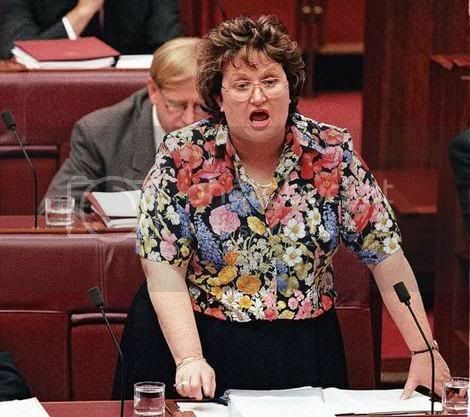 AUSTRALIA has breached the Vienna Convention with a diplomatic shortcut to parachute dumped minister Amanda Vanstone into the ambassador's post in Rome. The deputy secretary of the Department of Foreign Affairs and Trade, Doug Chester, formally notified the Italian embassy in Canberra of Ms Vanstone's appointment only hours before Foreign Minister Alexander Downer announced it publicly on Thursday. John Howard yesterday insisted that everything had been done correctly in sending his former immigration minister, who he dumped from cabinet in January, to Rome. "I think Amanda will be a very good ambassador," he told Melbourne's 3AW radio yesterday, defending Opposition claims the Government was turning the diplomatic corps into a "Liberal employment agency". "I support the idea that you should have some former politicians as diplomats. I think they do a very good job; most of them do," he said. The 1961 Vienna Convention, which sets out the rules for diplomacy, requires Australia to wait for Italy's official approval before accrediting new diplomats - giving Italy a chance to knock back nominations in confidence. The process normally takes a month or two. "The sending state must make certain that the agrement (a French term for approval) of the receiving state has been given for the person it proposes to accredit," the treaty says. "The receiving state is not obliged to give reasons to the sending state for a refusal of agrement." Old nuclear weapons base open to tourists. China has declassified its first nuclear weapons base and is inviting tourists to visit the site, in a remote part of the northwestern province of Qinghai, the official Xinhua news agency reported on Thursday. Built in 1958 over more than 1100 square kilometres of the grasslands of northern Qinghai, the base was the birthplace of China's atomic and hydrogen bombs, but was closed in the late 1980s, Xinhua said. China became a nuclear power in 1964. "The underground headquarters of the nuclear weapons research and production base are a curiosity to many people. They can see the 'nuclear city' for themselves," the report quoted Zuo Xumin, an official in the mainly Tan region where the base is situated, as saying. "The base will be developed into a key travel site, and it will become a platform for spurring the patriotic spirit of Chinese people," he said. Opening the base is a rare move for China, where the definition of state secrets is notoriously broad and its weapons development is seen as highly sensitive. The headquarters of the base comprises several rooms more than 9 metres (30 feet) underground and reinforced with concrete, which originally held a research laboratory, electricity generation room, telegraph transmitting room and a command room. Tourists will be able to visit the underground rooms, which now stand empty, the report said. A museum built at the base now houses old machinery, as well as clothes and food coupons that belonged to the workers who once staffed the remote site. I might want to go see the old nuke site. The only way you'd get me into the Sichuan "women's town" would be to super-glue my gonads to a Long March rocket and fire it into the village. Not even ol' Amanda there is going to have me kneel on uneven boards or wash restaurant dishes for having a mind of my own. All the latest in one hit. These guys were not exactly Snap, Crackle and Pop. What began as a faint popping in a 9-year-old boy's ear - "like Rice Krispies" - ended up as an earache, and the doctor's diagnosis was that a pair of spiders made a home in the ear. "They were walking on my eardrums," Jesse Courtney said. One of the spiders was still alive after the doctor flushed the fourth-grader's left ear canal. His mother, Diane Courtney, said her son insisted he kept hearing a faint popping in his ear - "like Rice Krispies". Dr David Irvine said it looked like the boy had something in his ear when he examined him. When he irrigated the ear, the first spider came out, dead. The other spider took a second dousing before it emerged, still alive. Both were about the size of a pencil eraser. Jesse was given the spiders - now both dead - as a souvenir. He has taken them to school and his mother has taken them to work. Been there, done that - and it wasn't a faint popping, it was more like boy racers inside my head, and it was only one big ol' brown spider. It was awful...and everytime I tell people about it, they laugh! An odd-looking Canadian coin with a bright red flower has been found to be the cause behind a US Defence Department's false espionage warning earlier this year, The Associated Press has learned. The odd-looking - but harmless - "poppy coin" was so unfamiliar to suspicious US Army contractors travelling in Canada that they filed confidential espionage accounts about them. The worried contractors described the coins as "anomalous" and "filled with something man-made that looked like nano-technology," according to once-classified US government reports and emails obtained by the AP." 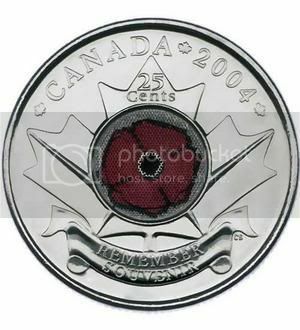 Unfortunately, the Canadian mint didn't do such a great job on the coins, the red coating on the poppy was easily damaged. I think it's an old coin. Yeah, 2004. There have been other symbols placed on the Canadian 'loonie' as we call it. The Canadian Cancer Society pink ribbon was minted shortly before I left.